PLURAL: two authors review one work. Linda Ganstrom and Ryder Richards. 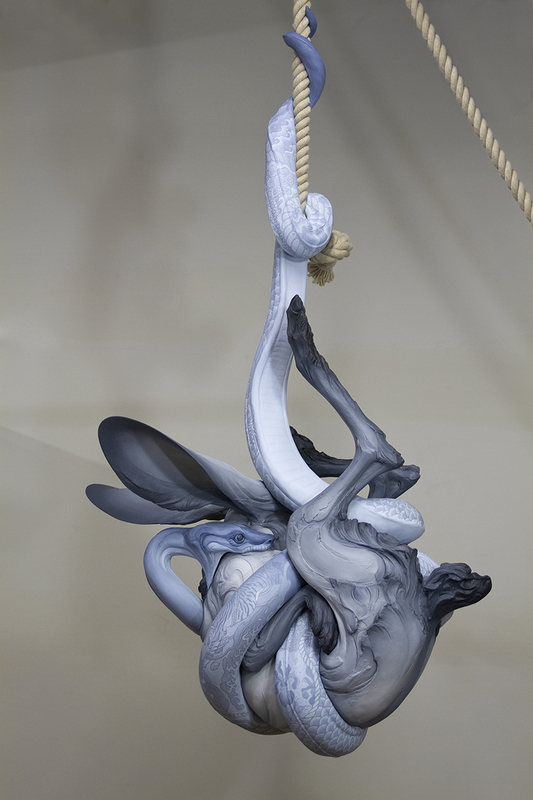 Tangled Up in You by Beth Cavener hangs suspended, gently swaying. 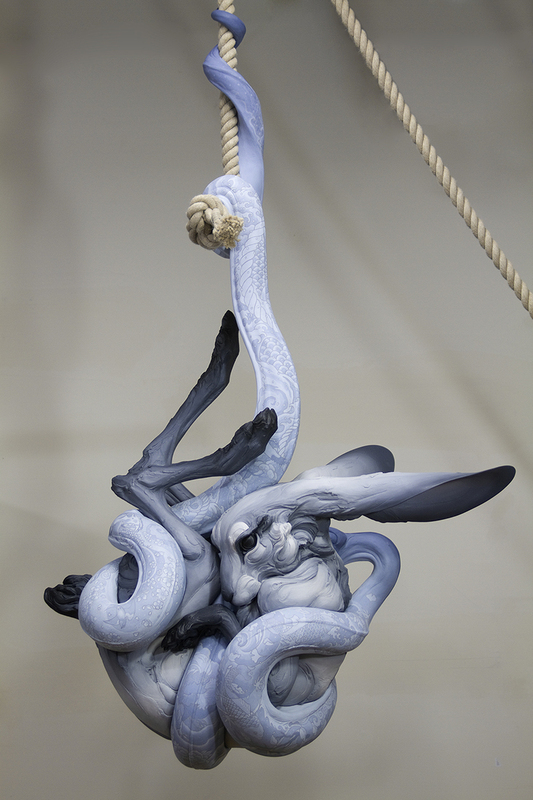 Gripping a thick rope, the snake strives to consume a large captive hare depicting a conflict with no resolution, a psychological state powered by tremendous emotion. Elegant tattoo patterns illustrate this story of conflict, striving and beauty on the skin of the snake in subtle blue on blue, adding to the watery aesthetic. Requiring the intent viewer to follow the muscular movement of the snake around the tortured hare to read the tattoo, the careful observer is rewarded with secret insight as they decipher the poetic symbolism. The huddled hare, compressed and dangling within the constrictive musculature of a serpent, appears placidly composed, resigned to fate. As if stunned by the shear beauty of the tableau it inhabits the hare’s concession seems poignant, a willing partner seductively bound into complacency by a highly narrative, writhing design. A superficial ploy, the graphic storyline applied with dexterity introduces an intoxicating lure to which we fall prey. 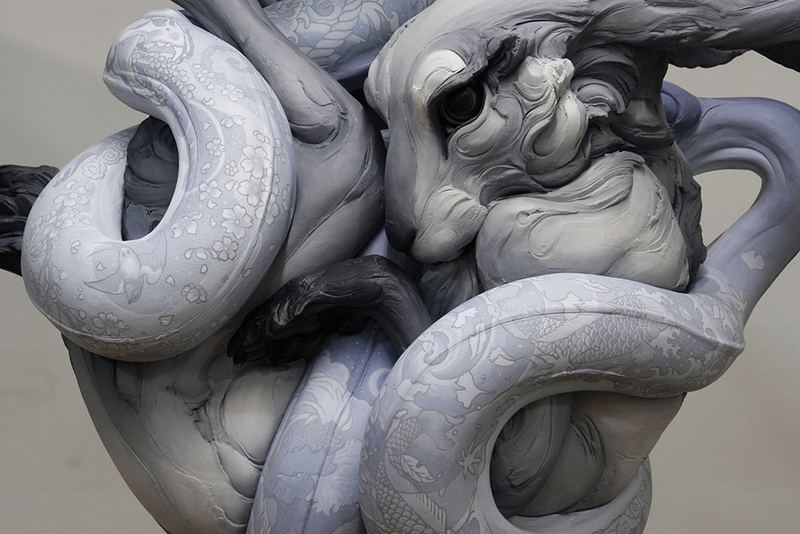 Referencing Aesop’s hare, Chinese ceramics, and Japanese tattoos the piece presents confused moral metaphors of entwined cultures, and a common conundrum: high craft as trap, from which there is no desire to escape.